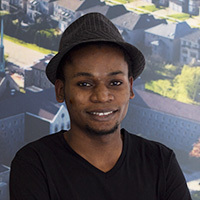 Axel Kazadi [MTS 2015] plans to pursue a PhD. He researched a topic that he is passionate about: the divine passibility of God. “I’m interested in understanding whether God is able to suffer relationally with us or whether our human suffering affects Him.” In Grade 12, Axel experienced depression and God’s presence after a tragic event. “I thank God for helping me overcome that situation and giving me the peace I was looking for.” The experience encouraged him to explore theology, which led him to Tyndale Seminary. “I want to do my PhD because I feel like there is more that I need to learn and I want to teach theology.” He hopes to aid the church by providing good theological teaching.